Another snow dusting overnight bringing a further 30cm fresh powder and continuing through out the day with winds decreasing. Great packed powder on piste with powder condition on the side and through the trees. The trains are now running between Tokyo and Myoko allowing everyone to get here and enjoy all this fresh snow. Still some problems with the roads and Route 18 is still partially shut with jammed trucks, cars and buses. So plan your route carefully if driving. 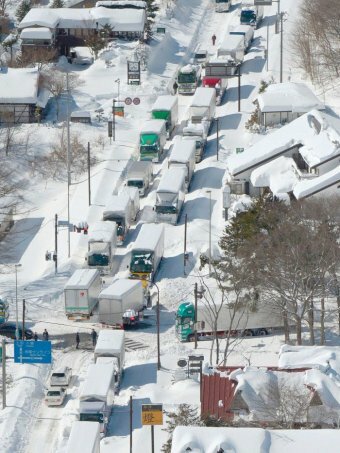 This is the scene near Karuizawa on the opther side of Nagano. Yesterday the sun shone through in patches while over on the other side of the range this was the scene at Matsumoto Castle. Matsumoto is a nice day trip from Myoko that takes about two hours by train. Current Snow Conditions: Packed powder on piste, powder in the trees. Over in Madarao Kogen they have 240cm base with light snow falling. It’s foggy and visibility is poor. However the snow is in great condition. Time to hit Powder Theater or Crystal Bowl!